A full line of vacuum cup suspensions and bellows-style suction cups that are designed for “soft touch handling” in pick-and-place automation systems is available from ANVER Corporation of Hudson, Massachusetts. ANVER Soft-Touch Vacuum Cup Suspensions feature spring suspensions made from stainless steel and a wide variety of bellows-style vacuum suction cups for gently handling delicate loads with minimal force. Compensating for variations in object height, these spring-loaded suspensions and cups absorb shock and provide constant pickup pressure for optimum load control. Available in 10 sizes from 1.14” H to 6.61” L with 0.20” to 2.8” travel, ANVER Soft-Touch Vacuum Cup Suspensions can be supplied in non-rotating versions for handling loads that must retain their orientation. Suitable for a wide range of automation systems and packaging machinery, they can be equipped with snap-on fittings and round or rectangular suction cups. 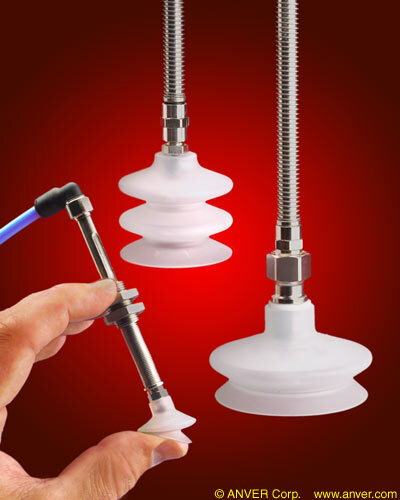 ANVER Soft-Touch Vacuum Cup Suspensions and suction cups are priced according to size, style, and quantity. Samples and literature are available upon request.